Each comfortable villa has a living room and dining area along with a full kitchen. These spacious accommodations also feature a balcony and laundry facilities. 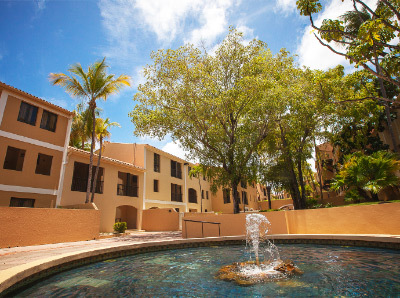 Spacious one, two and three bedroom villas make up the accommodations featured at Park Royal Homestay Club Cala, part of the Palmas del Mar resort community in Humacao, Puerto Rico. Guests can cool off in two beautiful swimming pools, choose between three championship golf courses and play a rousing game on the property’s tennis courts. The hotel also offers access to a beach club, a marina and complimentary shuttle services. This hotel charges additional taxes and a resort fee to be paid at the hotel.